Road to Brexit: what happens now? 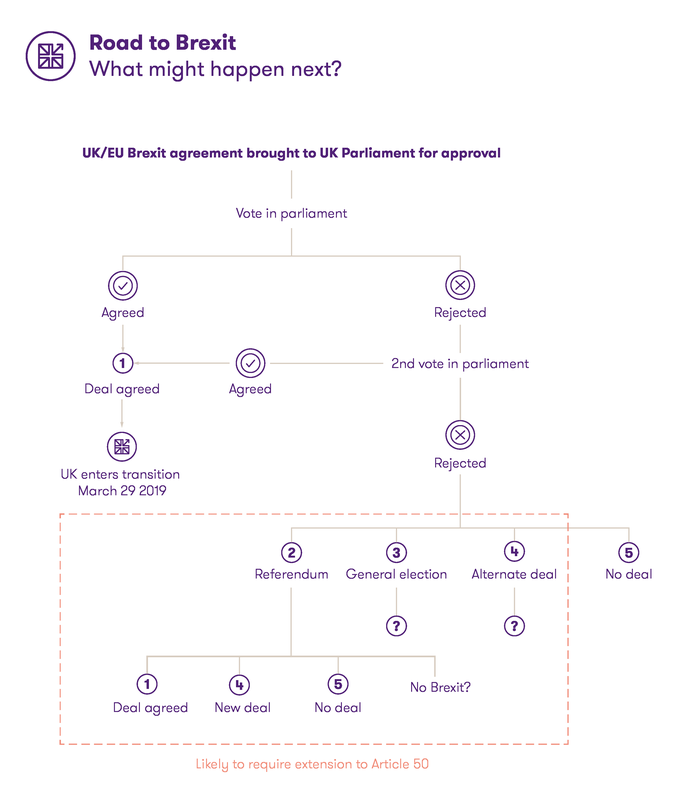 As Parliament prepares to vote on Theresa May's Brexit deal, we look at how things may play out. The House of Commons must ratify the agreement by simple majority. If approved (1) the agreement then returns to Europe for ratification from the European Parliament – again by simple majority. Barring a catastrophe the UK would leave the EU at 11:01pm on 29 March 2019 and enter into the transition period. What happens after this is for another blog. Is there parliamentary support for the deal? As it currently stands, with MPs from all Parties unhappy with the agreement, it appears that the government is set to lose this vote. If MPs reject the first motion, the Prime Minister is required to return to Parliament within 3 sitting days with a 'Plan B' to be voted on. If her plan is rejected a second time, we are in uncharted waters. I have tried to summarise the choices in the chart below. A second referendum (2) With Parliament unable to reach an agreement, they may turn to the people via a second referendum. Depending on the wording of the question this could lead to the UK: accepting the current deal (1), choosing No Deal (5), adopting a new deal (4) or even rejecting Brexit altogether. A general election (3) In the aftermath of losing two votes, confidence in the Prime Minister and her Government will be fragile. If MPs feel that the Government cannot command a majority any more (for example, the DUP continue to remove their support) then a motion of no confidence may be moved. If the government loses two of these in the space of 14 days then a general election will be called. How this plays out and what it means for Brexit is unclear. It will depend heavily on the manifestos, and leadership of both main parties. A new deal (4) With the Prime Minister’s agreement rejected, MPs from all parties may unite behind a new plan – such as joining the European Economic Area and Customs Union. How this would work in practice is unclear – but a Parliamentary majority would offer a way out, though it would need renegotiation – something the EU may be unwilling to provide. There’s a catch… all of the above options come with the caveat that they probably require an extension to Article 50 to be achieved. An extension would require agreement from every EU leader (not guaranteed thought they have suggested it is possible) and would likely rest on the guarantee that the outcome provided a resolution. In this regard a second referendum may be the most palatable. If nothing changes, the UK will leave the European Union at 11:01 pm on 29 March 2019 with no deal, to trade on WTO terms. The Government has long asserted that 'No Deal is better than a bad deal'… whether this holds is yet to be seen. If rejected, when will we have clarity? In the event that the deal is rejected next week we can expect things to move quickly - though in what direction we do not know. A lot will depend on the size of any defeat and how key politicians and parties respond. As Adam has previously emphasised, our advice is to plan for the worst and hope for the best. Our work with clients has shown that No Deal planning identifies actions that will benefit organisations regardless of the outcome of Brexit. 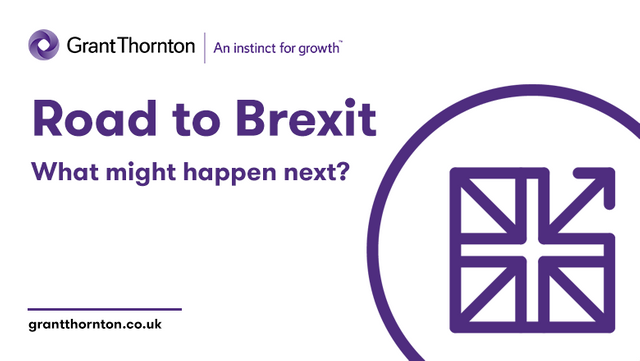 Whether that is changing the way they develop and attract talent, improving communication and governance or restructuring supply chains – Brexit planningdoesn’t have to be a sunk cost, wasted if all stopped tomorrow. We are here to help – do get in touch. This is a further failure of negotiation.